Chocolate Cupcakes... Who doesn't like a rich moist chocolate cupcake? Nobody. By omitting the oil completely and replacing it with apple sauce this cake is so moist you can't even handle it! These cupcakes are sweetened with maple syrup and made with 100% whole wheat flour. If you're already planning on making a dessert for your Honey-Boo-Thang this Valentines Day, or maybe this Thursday (no judgment), why not bake them a treat that won't cause their blood sugar to spiral out of control? Try it, it won't kill you, it might even make you stronger... unless you eat 6... then you might feel sick... and could possibly get the runs, so maybe just eat one? 😉 Sure, it's pretty healthy, but they are still cupcakes, so go easy on them. As for the frosting. 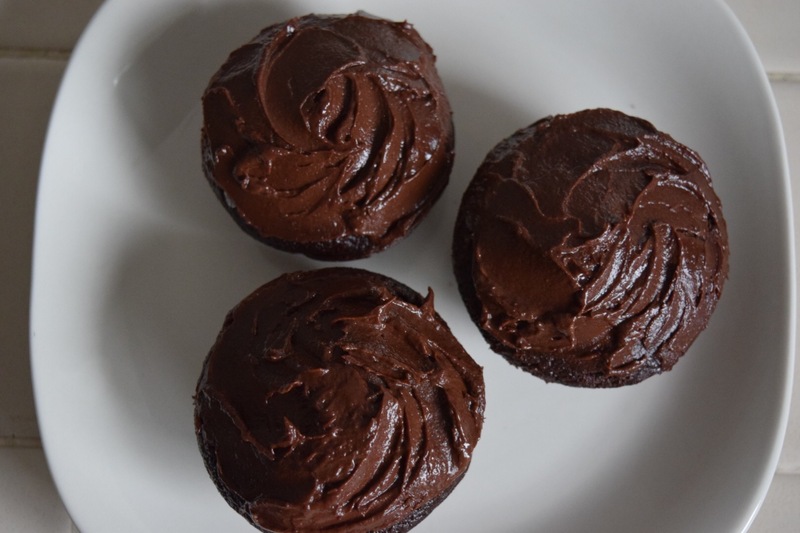 Frosting is the best part of cake (in my opinion) so you could use my Vegan Chocolate Fudge Frosting recipe (link below), my Chocolate Almond Butter Frosting recipe (link below) or stay tuned into this website as I will be posting a Chocolate Avocado Frosting recipe soon! All of my frosting recipes use zero oil, butter, margarine, or sugar and yet still taste smooth and creamy and chocolaty delicious! ALSO I am currently experimenting with turning this recipe into German Chocolate Cake. You know the type with coconut and pecans on top? Be afraid, be very very afraid. Not really! Just be excited, eat some beans, dark leafy greens, and prepare yourself for a treat! Lightly grease 2 cupcake pans (enough to make 24 cupcakes). Stir almond milk and vinegar together and let sit for two minutes. Add apple sauce, almond butter, and maple syrup to the almond milk. Stir to combine. In a separate bowl mix whole wheat flour, cocoa powder, baking soda, baking powder, and salt together and add to the liquid ingredients. Divide the batter between your cupcake pans. Place in the oven and bake for 25-35 minutes. If cupcakes aren’t done after 25 minutes then check them every 5 minutes until a toothpick comes out clean (if you added the extra 1/4 cup maple syrup to make the cake sweeter then it will take about 10-15 minutes longer to bake). Remove the cupcakes from the oven and let them sit in the pan for about 5 minutes. Gently take the cupcakes out of the pans and set them on a cooling rack to cool completely before frosting. Make frosting of choice, frost cupcakes, and enjoy! Store in the freezer to preserve freshness. One these looks soooo dreamy! We are chocoholics here at Three Brits so will def try these out! i hope you enjoy! 😉 i know you will! I had laugh out loud when you said that if you eat too many of the cupcakes you might get the runs. Using the applesauce in the cupcakes would make them nice and moist. Yumm. But I feel like using maple syrup on a regular basis could be kind of pricey. Have you tried using prunes instead of dates for your desserts? The University mkt makes a nice moist prune cake. Thanks for walking with me tonight. Dad said that he was able to have a good talk with Wils grandson at the reception.